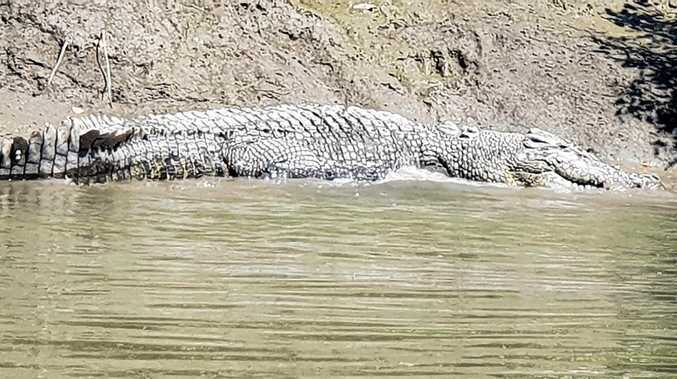 PROSERPINE River is 'infested' with crocodiles according to a Mackay angler who spotted at least 30 and snapped a 4-metre monster while fishing with his family at the weekend. Fishing for king salmon, Mr Cocup, his wife and son glimpsed some small crocs on the river bank as they set out but they soon got larger. "We started the day by chasing some bait up the river and as soon as we got on the water we could see a couple of three-metre crocodiles, which isn't new at Prossy, they're every- where," he said. "The further I got up the river the larger they got. I probably saw a couple of five-metre ones briefly but the one I got the photo of was probably around four metres. "The crocodiles didn't seem to worry anyone in the boat to be honest. We've seen plenty before and as long as you leave them alone you will never have any problems with them. "If you take into account the little ones we would've seen approximately 30 plus," Mr Cocup said. "Some of the big fellas didn't move at all and others just slid into the water. "It's not quite the most I've seen there, but it's possibly close I think. "There's been some days up there when it's been absolutely infested with some quite large ones". Several North Queensland MPs have called for a crocodile cull, but Mr Cocup believes that's not necessary. "If they were causing a drama and people were getting attacked or harassed it might be a problem but that's not the case," he said. "Even then, you can trap and remove any problem crocodiles. "I was walking in waist-deep water yesterday (Sunday) so no, I don't really think they are a problem at all." However, with crocs now turning up in places they haven't been seen for decades, safety should be at the forefront of every fisherman's mind, he warned. "Anyone who goes fishing should be aware of the crocodiles, wherever they go, especially considering the population seems to be booming. "They are popping up in places where you just wouldn't think they would be. "(But) I won't stop fishing there (Proserpine River). Crocodiles aren't a new thing to me as I've been aware of them for years in a lot of the places I go fishing, It's their environment so we have to work ourselves around it," he said. According to Queensland Government data, 476 crocodiles have been reported to CrocWatch statewide so far this year and 36 'problem crocodiles' have been removed from waterways. Under the Queensland Crocodile Management Plan initiated on March 14, 2017 a total of 387 crocodiles were reported between then and the end of 2017, while 68 problem crocodiles were removed. Departmental wildlife officers currently have four problem crocodiles targeted for removal. For more information about reporting crocodiles, visit the Queensland Government's CrocWatch website.